complaints, refunds & credits | other domestic airline options | what happend? Nature Air has been grounded since a fatal crash on December 31, 2017. In February of 2018 the General Directorate of Civil Aviation (DGAC) reinstated Nature Air’s permission to operate but no flights ensued. Announcements in the news media in January, February and April of 2018 that flights would resume soon were in error. In May of 2018 the DAGC suspended Nature Air’s main operating permit indefinitely due to “abandonment of assigned routes.” This effectively killed any hope of resuscitating what was once Costa Rica’s premium domestic airline. In September of 2018 the latest development had Aerobell picking up scheduled services on several of the routes. If you reserved your vacation with a reputable travel planner or agency they will provide you with flights on SANSA or other alternative transportation or a refund. If you paid for reservations directly with Nature Air then most likely your money is simply gone. Early in 2018 NatureAir was offering “flight credits” but never refunds. Now that it’s apparent there will be no more flights they have not established any mechanism for refunds and no longer answer inquiries. The toll free phone number established for refunds is disconnected. 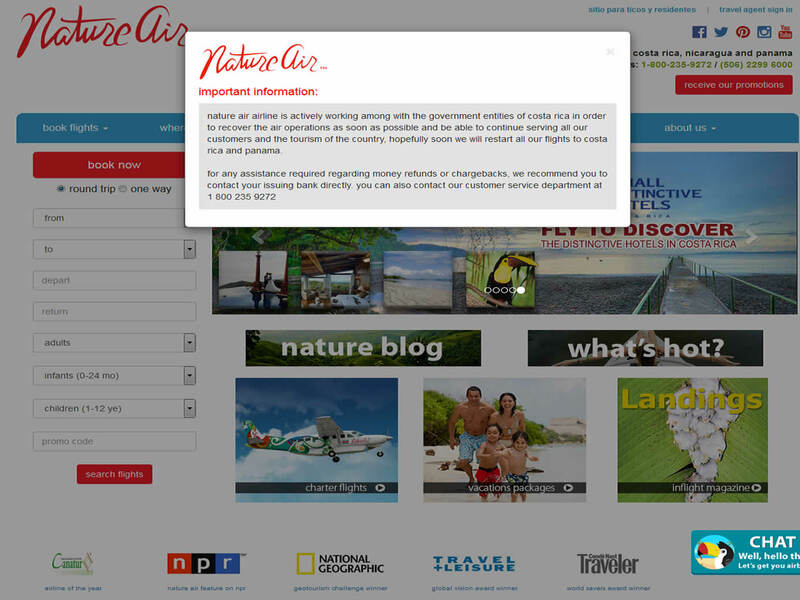 Despite a chat, e-mail contact and toll free number displayed on their website, NatureAir is incommunicado. Statement on the NatureAir Website “Nature Air airline is actively working among with the government entities of Costa Rica in order to recover the air operations as soon as possible and be able to continue serving all our customers and the tourism of the country, hopefully soon we will restart all our flights to Costa Rica and Panama. Although Aerobell has taken over many of NatureAir’s flights they are not honoring NatureAir tickets. In consumer disputes that don’t rise to the level of a crime it is possible to file a consumer complaint against a business. The chances of any action being taken are slim and the chances of that action leading to you getting a refund are (in our opinion) zero. If you feel it’s somehow your civic duty as a world citizen or you think it might make you feel better knowing you’ve “done everything you can” and you would like to go through the exercise of filing a complaint submit a “denuncia” to the Ministerio de Economia, Industria y Comercio. NatureAir was first grounded on New Years Day 2018 after a crash with no survivors of a charter flight for a Backroads Active Travel tour carrying two families from the U.S. from the Punta Islita resort on the central Nicoya Peninsula. NatureAir used to operate Twin Otter DHC6 300 Vistaliners and other twin engine aircraft and one rumor of why they went out of business was that they could not make the payments on the more expensive planes. The advantage of having a second engine available in case of mechanical difficulties is obvious. Ironically enough the plane that crashed was one of the few single engine models they operated. However the engine was operating normally and not blamed in the crash. There have been rumors of accounting irregularities and preferential government treatment of the national airline (SANSA) over the foreign owned Nature Air but whatever the reason it looks unlikely that Nature Air will ever fly again.